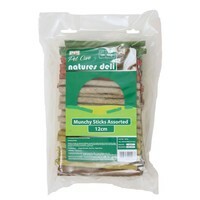 PPI Rawhide Munchy Sticks Assorted are delicious high protein and low fat treats that can be given as an in between meals snack, or as a reward as part of a balanced diet. Supplied in a variety of green, red, brown and yellow chews, the Munchy Sticks are the perfect solution for keeping teeth and gums healthy by reducing plaque and tartar build up. Great value for money. Quick tasty treat. My dogs like them very much!